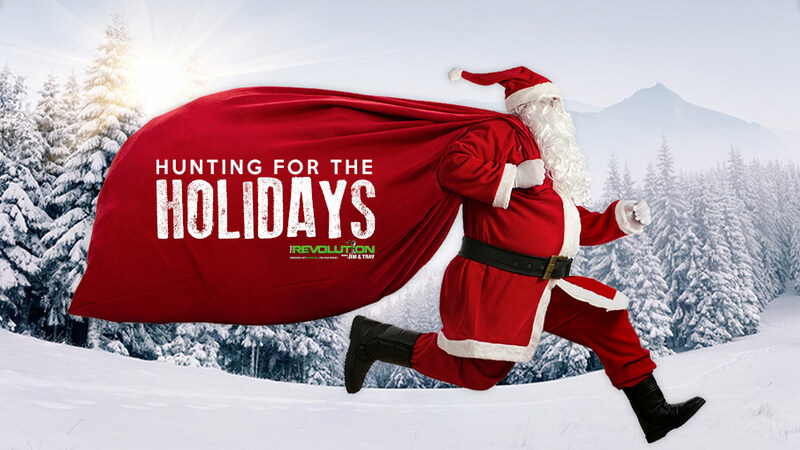 This week on The Revolution with Jim and Trav presented by Outdoor Channel, Sportsman Channel and World Fishing Network, we're ‘Hunting For The Holidays’. So, are you wanting to impress the outdoorsman or woman in your life with a great gift this Christmas? If you said yes, you'll need a solid plan, and it all starts here. From ammunition to gloves, ground blinds to jump starters, hunting apps and knife sharpeners, as well as lifetime hunting and fishing licenses, and everything in between, the boys and their outdoor shopping experts have literally got you covered. Our camo clad shopping crew includes: Dean Capuano of SWAROVSKI Optik Quests, Jill Gechter with CINCH, Tom McMillan of MCMILLAN and Melissa Bachman from Winchester Deadly Passion. Optics are a great gift for the outdoorsman or woman in your life. Regardless of the game you pursue, quality optics are an important part of any hunter’s success. Tune in as Dean Capuano, host of SWAROVSKI Optik Quests on Outdoor Channel, discusses some great optics from Swarovski Optik. If you are looking at binoculars and hoping to make a lifetime purchase, Dean says that Swarovski EL and SLC Binoculars are top-notch options. “Whether you like a big binocular with high magnification or some of the smaller ones that can fit in any pocket or travel bag, we’ve got a little bit for everybody.” Dean encourages buyers to visit local dealers to pick up, look through and try the different models available to figure out exactly which one is right for them. A team of knowledgeable customer service representatives, and dealers, are well versed with all the Swarovski products, so they can help buyers make the right decision. Buying quality optics is an investment, however they are worthwhile. Dean makes it a priority to test the products himself. He puts the gear through the rigors of hunting to see what it can withstand, and says that their optics can take virtually any punishment a hunting trip can throw at them. Tune in for more! Melissa Bachman, host of Winchester Deadly Passion on Sportsman Channel, spends the bulk of her time afield, chasing wild game across the country. Hunting, day in and day out, gives her the opportunity to field test a lot of gear and she’ll be sharing some of her favorites that would make great gifts this week on The Revolution. Melissa starts with a really practical and versatile gift for hunters, a ground blind. She says that the Field and Stream Ultimate 360 Ground Blind is a homerun. Ground blinds provide a safe and more spacious environment for bringing kids to the field with you, but they also have the added benefit of being warmer and more comfortable for all day sits. Melissa is impressed with not only the price tag, but the design, large windows and the ability to brush it in well with your surroundings. Next, Melissa says that Winchester Deer Season XP ammunition should be a crowd pleaser for deer hunters. It comes in a wide variety of cartridges and is designed specifically for deer hunting with massive knockdown power. It features a large diameter polymer tip that accelerates bullet expansion for rapid trauma upon impact. To wrap things up, Melissa concludes with a story about her 79-year-old grandma laying the hammer down on a monster mule deer in Colorado. Don’t miss this fun interview! Tom McMillan is the star of MCMILLAN on Sportsman Channel. In its fourth season, MCMILLAN gives a first-hand look at the life of Tom McMillan as he and wife, Jacque, navigate the demands of outfitting, guiding, ranching, hunting and raising a toddler. Each week is filled with action packed hunts on the Great Plains of Kansas and throughout the Midwest. Tune in as Tom joins Jim and Trav to offer up his unique gift ideas for the sportsmen and women in your life. Tom starts with gifts that keep on giving all year long like the rechargeable spotlights and jump starters from Peak. The rechargeable spotlights can be kept in your vehicle year round and charged as needed with the power sources available in it. A jump starter is a practical gift that allows you to jump your own vehicle without making phone calls and waiting for someone to come along and give you a jump. Not being stranded is a great gift! Tom then turns his attention to YETI and says that they have so much more than just coolers! Although the gear you purchase may cost a little more coin, Tom says the quality of the product is worth it. Finally, Tom says that the MyOutdoorTV app is a great gift for anyone. The MyOutdoorTV app gives viewers access to an extensive library of their favorite outdoor shows on Outdoor Channel and Sportsman Channel. Watch on-demand on your PC, Mac, phone or tablet from virtually anywhere. Tune in for the full interview and more great gift ideas from Tom McMillan, listen now!